It's going to be the end of the week before the plumber can do the rough work and move the shower drain so in the meantime I thought I'd frighten myself by ignoring the bath remodels and looking at the budget for the 2008 kitchen remodel. I started this spreadsheet back in July 2004 when we purchased the Sub-Zero with a view to building the kitchen around it and completing it within two years. It seems we were a little optimistic in our timeline. Over the past two and a half years I have researched options for replacement cabinets and countertops, chosen 16x16" and then 20x20"floor tiles, and picked out stainless steel appliances. The spreadsheet is a thing of beauty with internet links, retail and discount prices, lead times and possible alternatives. As we changed our minds about products, new versions came on the market, or prices rose, I updated the spreadsheet but the basic price of the remodel never fluctuated by more than a few hundred dollars. Walking around Soho one Saturday last October we wandered into Henrybuilt and fell in love with the hardwood cabinets, they seemed to have been designed with our house in mind. Suddenly the perfectly acceptable Ikea boxes didn't seem to cut it anymore, even if we used our own custom doors. The budget got a huge makeover, upwards. Then I starting reading the Brooklyn townhouse renovation blog Here is the House. Big mistake. And I showed the post on appliances to Steven. Even bigger mistake. 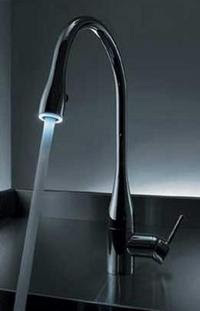 He fell completely in love with the Hansacanyon LED faucet and wouldn't be dissuaded even when I showed him the price. Of course you just cannot have a beautiful, expensive faucet pouring red or blue water into a bog standard kitchen sink, even if it is the BlancoPrecision 10: Super Single Bowl Undermount, sink of choice for Varenna and other German and Italian kitchen cabinet manufacturers. Never fear, Here is the House gave us an idea for a solution. We only have to add an extra $3000 to the budget and we can be professionally washing up, chopping vegetables and cooking with the Kohler PRO CookCenter sink. Actually, this will also solve a design dilemma too. We hate seams on countertops but the quartz we have chosen only comes in 10' slabs. Our sink area is 10' 8". If we go with the mega sink it is countertop width so we can have two separate pieces of quartz on either side. Smart but not priceless. The new kitchen budget? Even though we will save on extra plumbing by not having a prep sink on the island and we save the cost of an extra sink and faucet, it's increased by 50% since we started and that's without adding the built in coffee maker I have lusted over. I wonder what we can cut back on so we can afford this remodel before we get too old to enjoy it. Food maybe? That chick over at Heres The House sure is a troublemaker isn't she? :) Between the two of you I may end up being a modern decor convert! I'd like to invite you to check out Curbly.com - a DIY Design community for people who love where they live. We're establishing a passionate, creative user-base and drawing more and more traffic every day. We're trying to engage home-enthusiasts like you and provide a place where people can share ideas and get inspired. Let me know what you think! A spread sheet? I love it! While we do budget and stick to it pretty closely, I admit to jumping into a few projects and then realizing that you have to have the certain faucet or tile. I think you are on the right track. Doing without food should get you there. Who has time to eat when remodeling, anyway?